The refractive index is a physical property like a melting point, a boiling point, or density of a compound. It is very sensitive to the purity of the sample. It depends on the wavelength of the light it is acquired at and the temperature. Most instruments use the yellow sodium line (λ=589.3 nm, which is the average of the two emission lines at 589.0 nm and 589.6 nm) for the measurement, which is indicated by the letter "D" as a subscript. The entry 1 and entry 3 in the table below illustrates the change of refractive index with the change of the wavelength. The temperature has a major effect on the actual reading as can be seen in the formula below. Generally, the refractive index decreases with increasing temperature. The medium is less dense, the refraction of the light is usually reduced. Most refractive indices in the literature are reported at 20 oC or 25 oC. 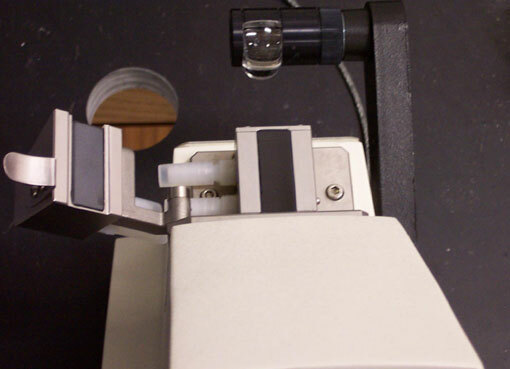 Thus, it is important to record the temperature at which the refractive index was acquired as well in order to take the temperature effect into account afterwards. The pictures above show the actual refractometer that will be used in the experiment. Pull the lever connected to the light downwards as shown in the picture. Then swing the prism open to the left (make sure not to scratch it!). At this point it would be wise to double check the area on which the sample is applied to in order to ensure that it is clean (If not, use a Kim wipe and acetone to clean it. Allow the acetone to evaporate completely). 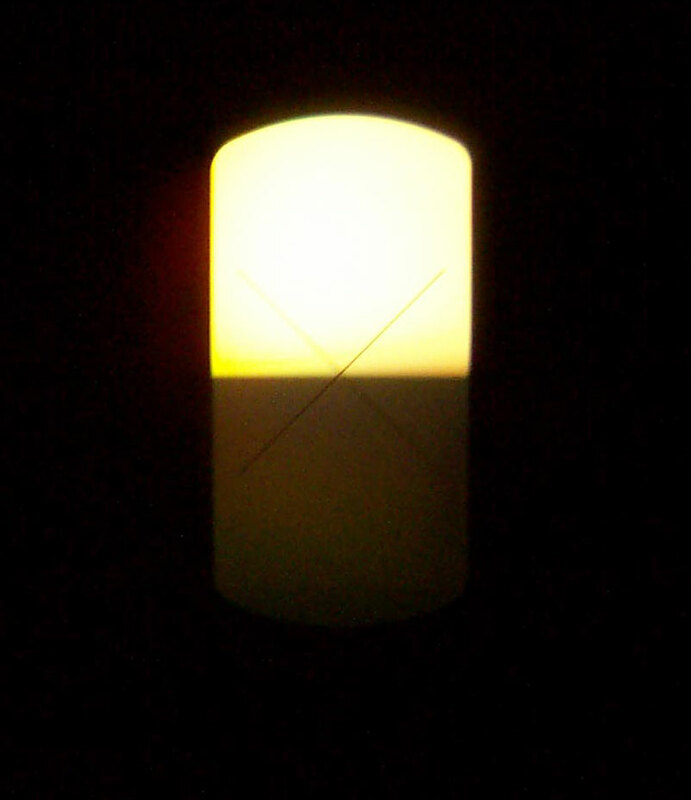 On the window that has been exposed upon swinging the prism open (the window directly in the center of the picture on the right), apply the sample. Make sure the sample covers the ENTIRE window with a thin film. 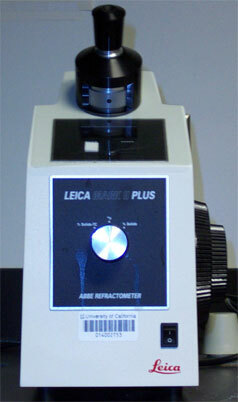 Partial application will result in an incorrect refractometer reading and difficulties to observe an 'edge'. Close the hinged prism and return the light source to its original position (all the way down!). Locate the power switch on the right lower side in the front of the instrument. Turn the dial to nD (middle). Place the lamp in the back on top of the prism. Now locate the eyepiece at the top of the instrument. You should see crosshairs with a shadow covering the lower part of the viewing range. 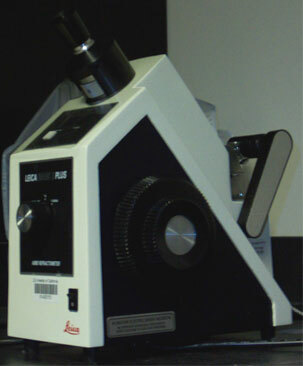 Using the adjustment knob (wheel) located on the right side of the refractometer, move the shadow until it intersects the crosshairs as shown above. 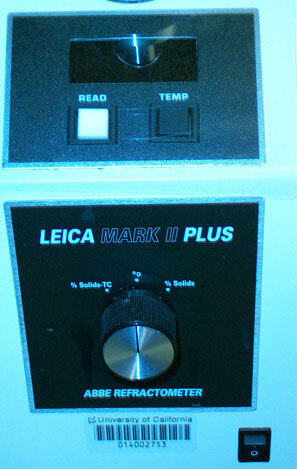 Push the "READ" button and record the refractive index with four decimal places i.e. 1.3945. Then push the "TEMPERATURE" button to get the temperature reading (on the built-in thermometer). Adjust the refractive index to the standard 20 oC using the formula given above. a. The viewing area does not show a separation into a light and a dark field. 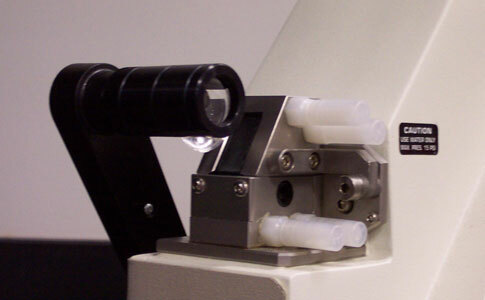 Check briefly if the range that you are in right now is anywhere ± 0.05 units of the expected refractive index (literature value) If not, make sure to get close to this range by using the adjustment knob on the right side. Keep in mind that it is relatively sensitive. b. The viewing area shows fancy colors and not just a light and a dark field. 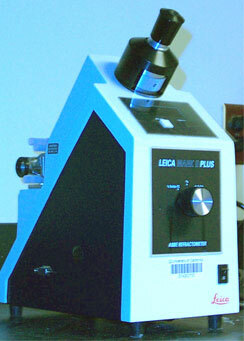 This is often observed if not enough material is applied to the prism and an uneven film is coating the prisms. The same effect is observed if the hinged prism is not pushed all the way down or the sample is imhomogeneous or strongly colored. c. There is not light in the viewing area. Is the instrument turned on? Is the lamp raised to its correct position? Turn off the instrument (if you are the last one using it) and open up the hinged prism. Wipe off your sample with a kim wipe. Rinse the entire area with a small amount of acetone and wipe it with a dry kim wipe. Dispose of the kim wipe in the trash container.